In the hotel industry water pressure fluctuations most frequently occur when numerous guests take a shower in the morning. The GROHE TurboStat® technology of the shower thermostats reacts quickly to temperature or pressure fluctuations and instantly and automatically balances them out. Whether surface or flush-mounted, with the SafeStop button at 38 degrees and GROHE CoolTouch®, it is also always available to limit maximum temperatures. Grohtherm Micro, mixes water to a predetermined temperature and is a perfect supplement to all fittings in public conveniences. 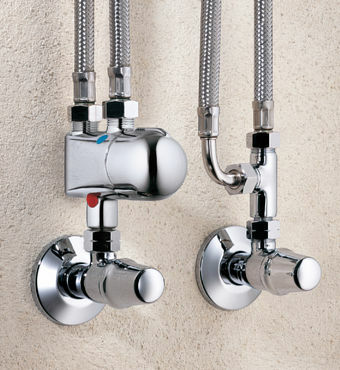 This goes for the classic self-closing fittings, such as Eurodisc SE and Contromix which are triggered by pressing a button, as well as infrared-controlled fittings, such as Europlus E, and also conventional two-handle fittings and single lever mixers. Thermal disinfection for the prevention of legionnaire’s disease is easy to operate and reliable. 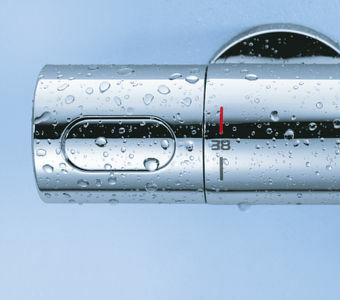 The Grohtherm Micro also functions as thermostatic protection in bathrooms with high safety requirements. In the event of failure of the cold water supply, the Grohtherm Micro automatically stops the water flow and protects against scalding. Even with small pressure variations, it quickly provides a constant temperature and flow. When there are “endless coming and goings”, designers and planners must think particularly in terms of hygiene. Bright, friendly and clear design helps counter any “fears of entering”. 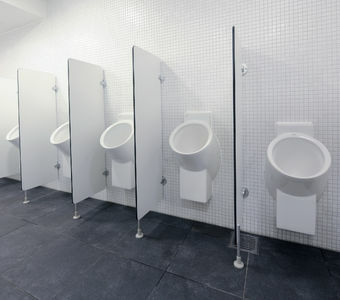 An orderly arrangement of WCs, wash basins and urinals is simple to implement with the Rapid SL installation elements in single or row mounting, on the wall or as room dividers for “standalone solutions”. 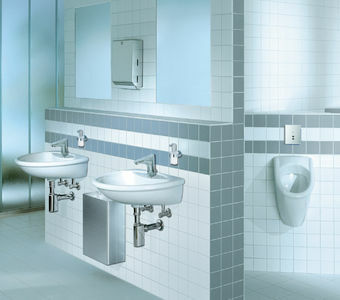 GROHE has different functionalities for actuation of the WC flushes (pneumatic with optional single and dual-flush triggering or start/stop; manual actuation or touchless via infrared beam), and is available in various designs that allow coordination of all sanitary appliances into a uniform line. 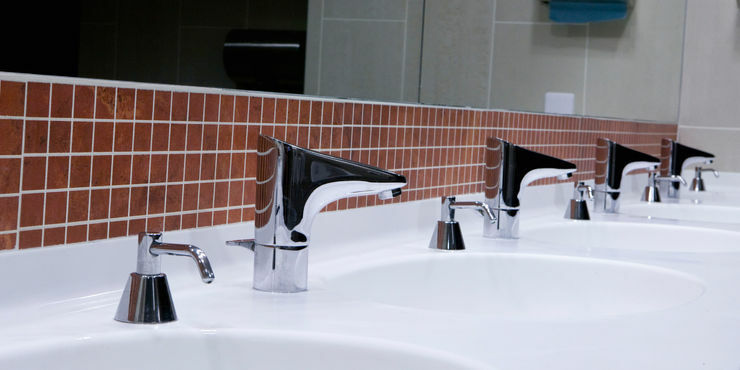 The touchless infrared electronic control ensures convenient operation and optimum hygiene at the wash basin. The water flow is started on demand as soon as hands approach the fitting. The flow also stops again automatically. The same basic principle applies to the electronic control of urinal flushing. Here, the infrared beam reliably responds to the approach of the body. The electronics feature various programming options and can, for example, set automatic flushing at fixed time intervals.